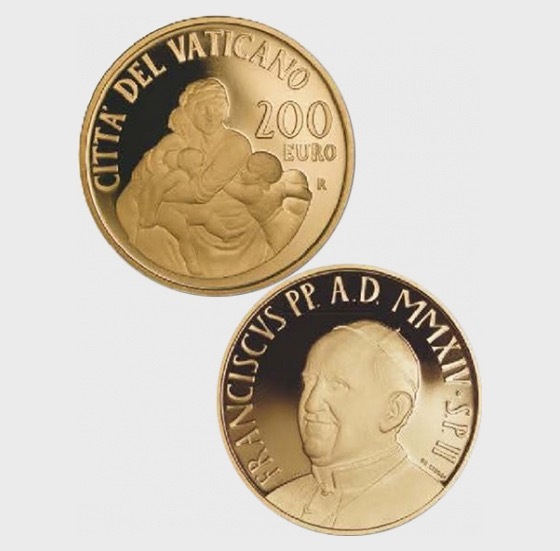 The obverse side of the coin shows the usual artistic interpretation of the face of our dear Pope Francis. The reverse side displays instead a detail of the allegorical representation of charity as depicted in one of the pedestals sections of the Baglioni altarpiece by Raphael, kept at the Pinacoteca of the Vatican Museums. According to the classic Christian iconography developed over the centuries, charity took on the appearance of a women embracing children. Only in Renaissance work she also appears flanked by two winged cherubs. The reason for such a representation can be found in the words of Jesus Christ himself who taught the Apostles that charity is love, giving of oneself unconditionally to others. There can be no better image representing unconditional love than a mother embracing her own children. Pope Francis has touched on the theme of charity numerous times looking at it from its various dimensions. In one of his recent daily meditations, he said, ''Today it will do us good to think about how my faith is, how my Christian life is: is it a Christian life of cosmetics, of appearance, or is it a Christian life with a faith which is active in charity?" Our way of being must prevail over our focus on appearance, since the faith "is not only reciting the Creed: we all believe in the Father, in the Son and in the Holy Spirit, in life everlasting..." But if our faith is "immobile" and "inactive", then "it's of no use". Thus, what's important in Jesus Christ is "the faith which becomes active in charity", and in so doing, gives true witness to God's love.